An extraordinary international event, John Adams’ Nixon in China makes its New Zealand debut at our Festival. One of the most celebrated operas of our generation, Nixon in China is an ambitious work on a grand scale, an iconic piece of operatic writing. Combining pulsating energy and soaring lyricism, with influences from big band to Wagner, it relates a compelling story of the historic meeting of two of the 20th century’s most titanic and controversial figures – Richard Nixon and Mao Zedong. Set in February 1972, Nixon in China opens on the runway of a chilly Peking (Beijing) airfield and the arrival of President and Mrs Nixon in Air Force One. It was the first time a U.S. president had visited the People’s Republic of China, and by visit’s end decades of enmity between the two countries had been shelved and the world was realigned in the process. 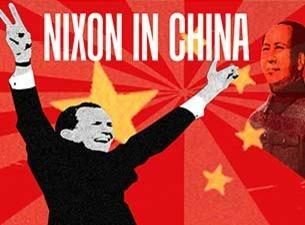 At its Metropolitan Opera debut in 1987, Nixon in China was dubbed ‘provocative, edgy, and audacious’. Nearly 30 years later, it’s become a modern masterpiece, admired for Alice Goodman’s poetically eloquent libretto and Adams’ magnificent score. This NZ premiere will go down in history. Produced by Auckland Arts Festival in association with Auckland Philharmonia Orchestra and New Zealand Opera, the semi-staged production has a fabulous cast conducted by Joseph Mechavich (USA) and an all-star creative team led by Sara Brodie (Don Giovanni). Tenor Simon O’Neill plays Mao Zedong, baritone Barry Ryan is Nixon, baritone Chen Ye Yuan is Zhou En Lai, soprano Madeleine Pierard is Patricia Nixon and soprano Hye Jung Lee is Madame Mao. With a set designed by John Verryt, and video created by Louise Potiki-Bryant, Nixon in China has all the might worthy of the history-making visit. Adams’s opera The Death of Klinghoffer entranced audiences when it was presented in Auckland in 2005, Nixon in China will do the same.